Today’s Metro kerfuffle involved a train coming slightly off the track near Silver Spring on the Red Line, which has caused single tracking around the incident. 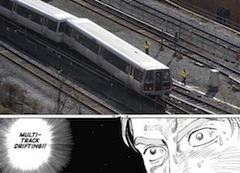 Of course, never to miss a good meme, Paulo points out that the train may well be attempting a sweet multi-track drifting technique only possible in manga books. Either way, avoid the Red Line near Silver Spring til they figure this out. I missed all that?!! That’s my exact view from my office. Interesting that WMATA seemingly refuses to call this a derailment.